Reading helps creativity and imaginative play – however if reading is hard for your child and the joy of books is lost on them, then turn to audio books. The human imagination is a powerful thing. Often, we see it most prominently in very young children, but somewhere along their journey we see it lessen and sometimes become lost. According to Dr Stephanie Carlson, an expert on childhood brain development at the University of Minnesota, children spend as much as two-thirds of their time in a state of imaginative play. After studying how preschool-aged children immerse in ‘non-reality’, she concluded that imaginative play helps children to develop their creativity and strengthen their problem solving skills by forging ‘imaginative pathways’ in their brains. 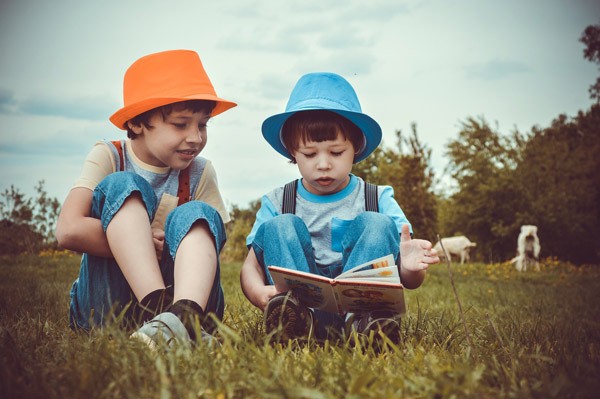 Reading to children and encouraging them to read on their own, helps to stimulate imaginative play in powerful ways. By providing books that provoke children’s sense of curiosity, fantasy and exploration, parents can support and encourage imaginative play in their children. However children struggling to read miss out on vital language resources. Listening to books in audio form can help them acquire not only a whole new range of experience, but a vocabulary beyond their own reading level and everyday conversation, enhancing fluency and comprehension. Their horizons expand, they absorb the structure and conventions of storytelling and develop much greater confidence to communicate both orally and on paper, which has enormous benefits to their writing. When they discover the excitement of books through listening, pupils want to read more rather than less. Good listening skills are essential for effective learning in all areas of the curriculum and will help pupils with their school work and their play. Audiobooks improve concentration and engage pupils with their studies, helping them to achieve at a higher level across the curriculum, hopefully instilling a lifelong love of reading. Audiobooks enable children to develop vital literacy skills in an enjoyable way. They restore confidence and self-esteem, allow children to inter act with their peers more and create imaginative play from book themes. Reading just 30 minutes a day flexes mind muscles, it makes children think, fantasise, and use their imagination.